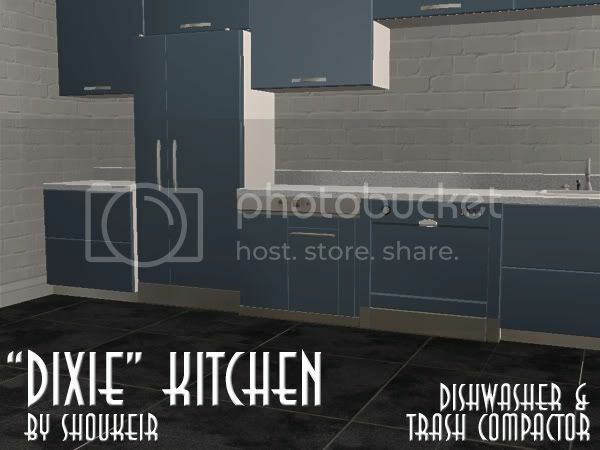 While I am waiting for my Internet at home to get repaired (and waiting on repairs to the system I usually do my Simming work on) - I turned my ambition and will to filling in the missing bits from my last set of additions: dishwasher and trash-compactor. These items are Maxis base-game items re-mapped and beaten into submission, they should work with all versions of The Sims 2. ATTENTION! This items use the repository method for texturing! You MUST download and install the "Dixie" counter by Shoukeir at Sims 2 Play for them to appear as designed! Credits: Shoukeir (naturally) for the original items and permission to post these additions; MsBarrows for explaining the repository method to me; psychosim0 for confirming that EP-requirements do not extend to dishwashers and trash-compactors. Personal note: the reason the refrigerator, dishwasher, and trash-compactor are not being posted at Sims 2 Play is simple, these items may require support and I do not wish to burden Shoukeir with the responsibility of answering questions and providing support for my work. Great job, as usual, Yakov. These are just great! Thank you! That makes the set complete, thanks! Wow, I'm in someones credits... I didn't figure on that, you're absolutely welcome! Just ran the game and there are no problems, as expected. Great job of completing a beautiful set. Thank you. So clean and shiek! Great job! Kinda reminds me of a Bachelor's loft.